It’s lighter than a WSB bike. Tipping the scales at 171.5kg, with its brushed aluminium 17.5-litre fuel tank brimmed full of super unleaded, it’s actually lighter than a World or British superbike. Their 168kg minimum weight limit is achieved with only a dribble of fuel in the tank. 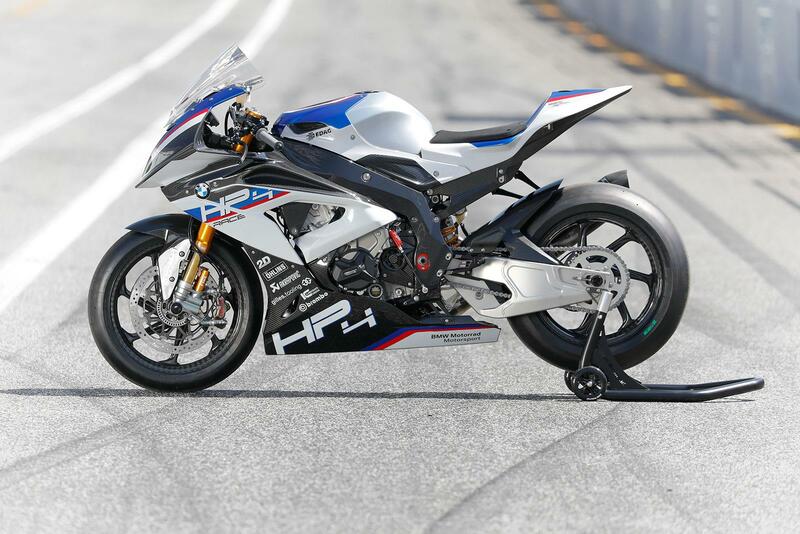 The HP4 Race is also 36.5kg lighter than a road-going S1000RR. 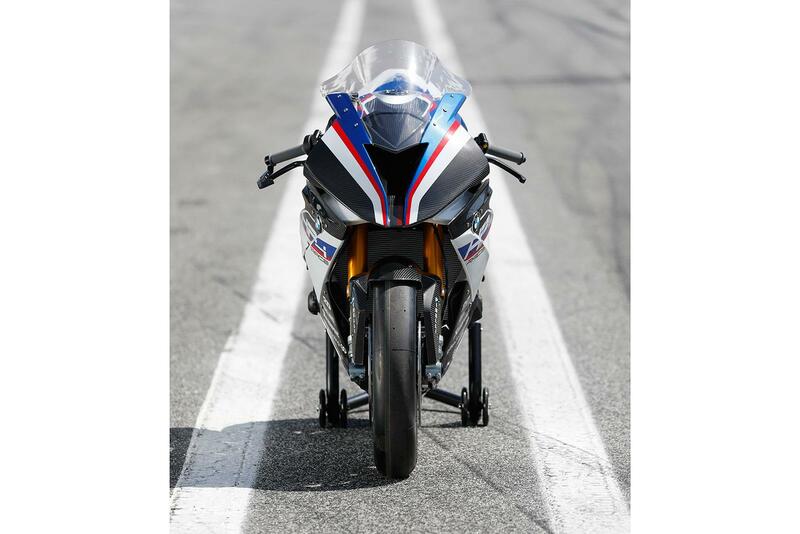 It weighs 149kg dry, making it 10kg lighter (dry) than the Ducati 1299 Superleggera and 4kg lighter than an A2-licence-friendly 44bhp single-cylinder KTM 390 Duke. 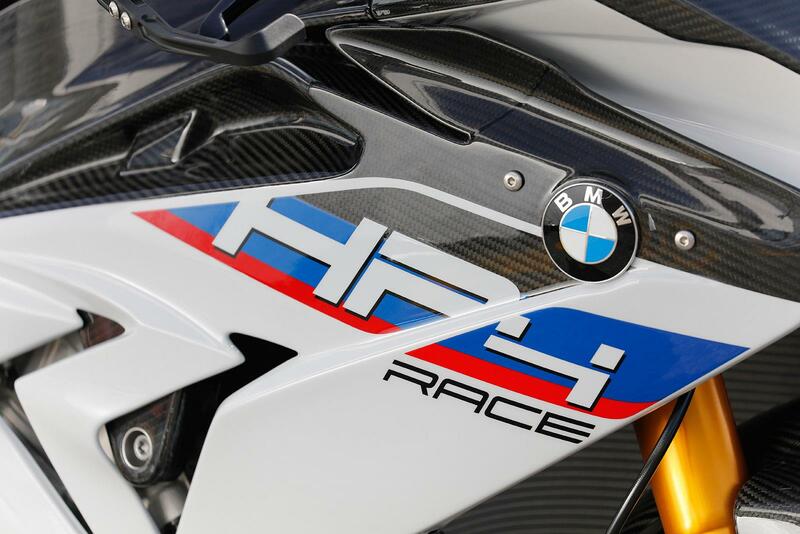 Carbon fibre is the HP4 Race’s dark secret and its high-strength, one-piece, industrially-produced carbon frame is 4kg lighter than the RR’s cast aluminium version. 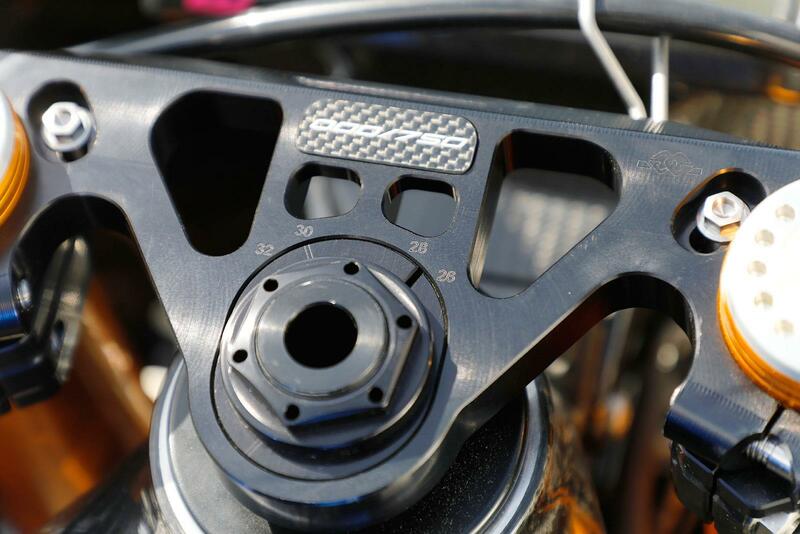 Carbon wheels, manufactured in the same way, are 30% lighter than forged aluminium racing items and the fairing, self-supporting three-way adjustable seat unit, mudguard and hugger (all conventionally hand-made) all save weifght. 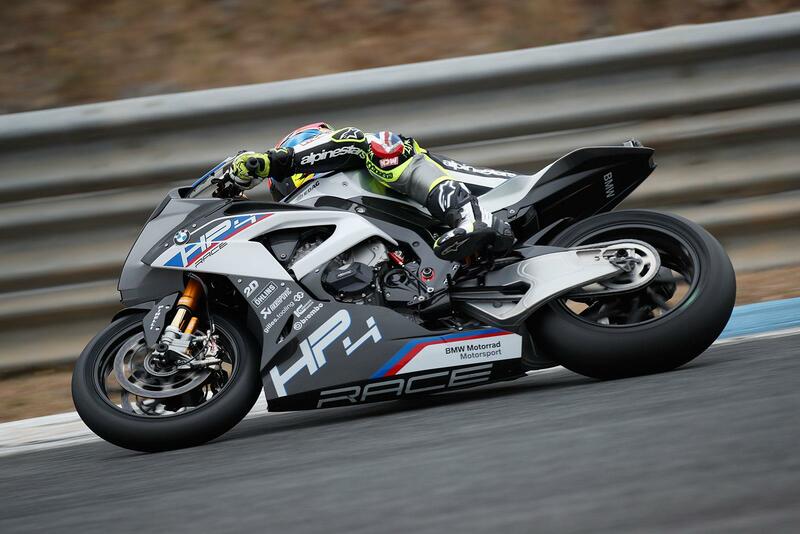 The HP4 Race is track-only, so it doesn’t need to carry a bulky Euro 4 exhaust, sound deadening, mirrors, lights, excess wiring, a side stand, indicators or number plate. 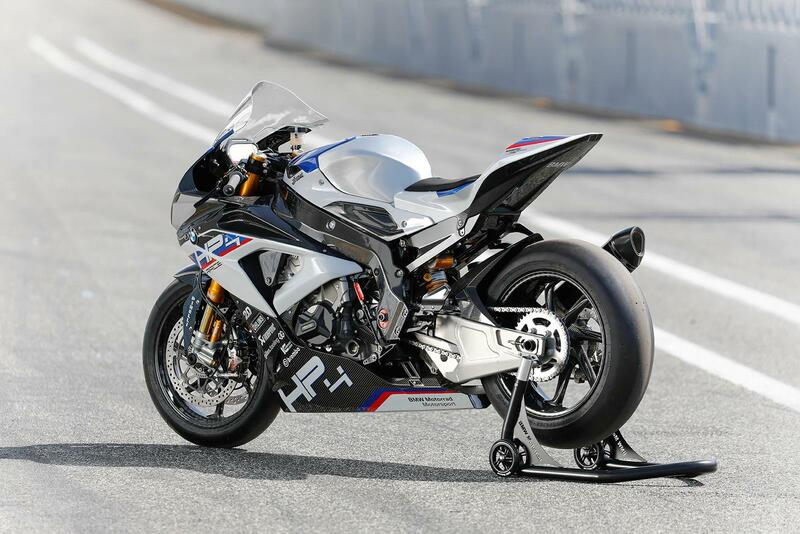 It’s sexier than a WSB bike. 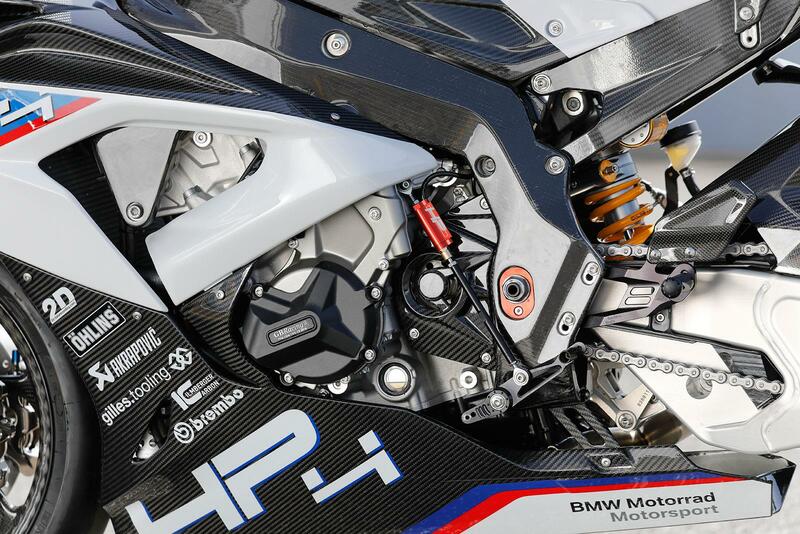 Up close even factory race bikes are war-beaten and frayed at the edges, but the HP4 Race is a work of art. That deeply braced swingarm and stubbier tail tell you this is no ordinary RR. Every inch of this machine is milled aluminium, high-gloss lacquered carbon perfection. 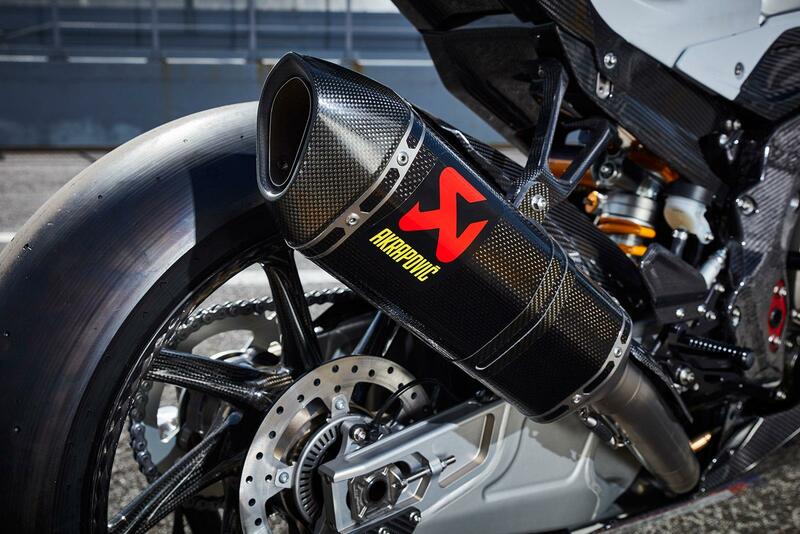 Just ogling it is a trouser-tightening thrill and taking it off its paddock stand (included) to push it around the paddock is as easy as walking with a pushbike. 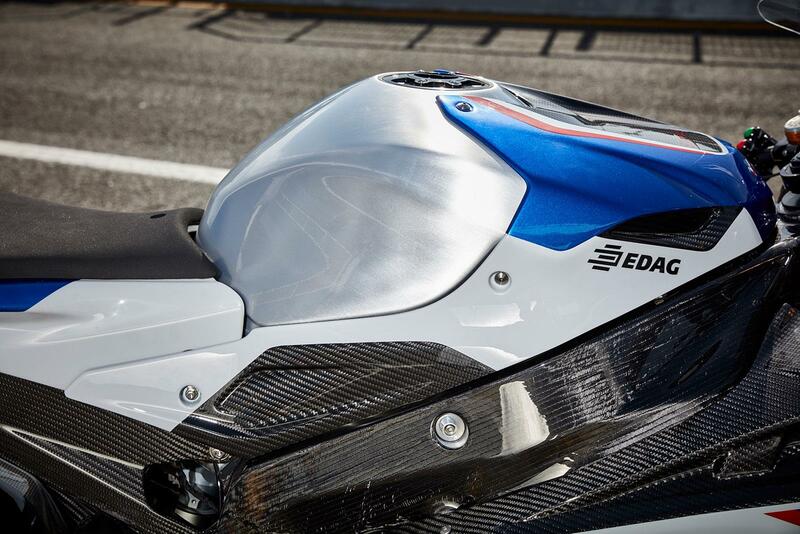 BMW has taken its S1000RR, scooped out the bulk, and injected it with steroids. 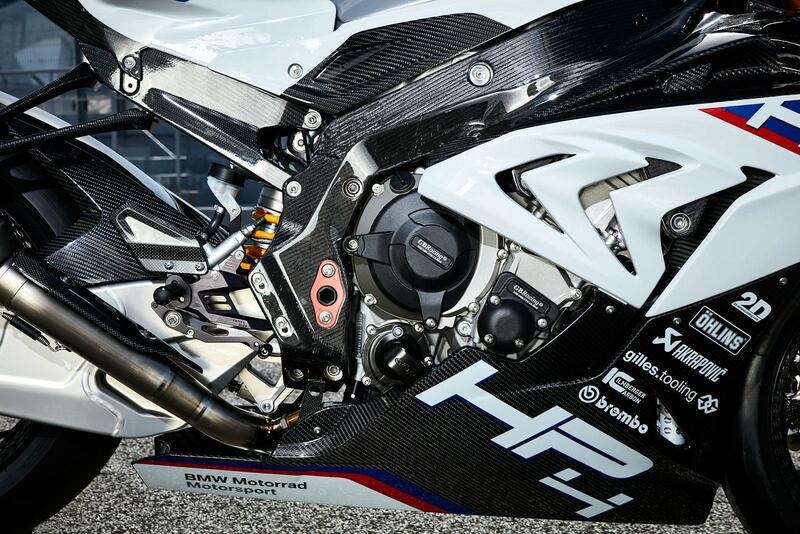 The resulting HP4 Race is a raw, hollow circuit weapon that’s an assault on the senses. 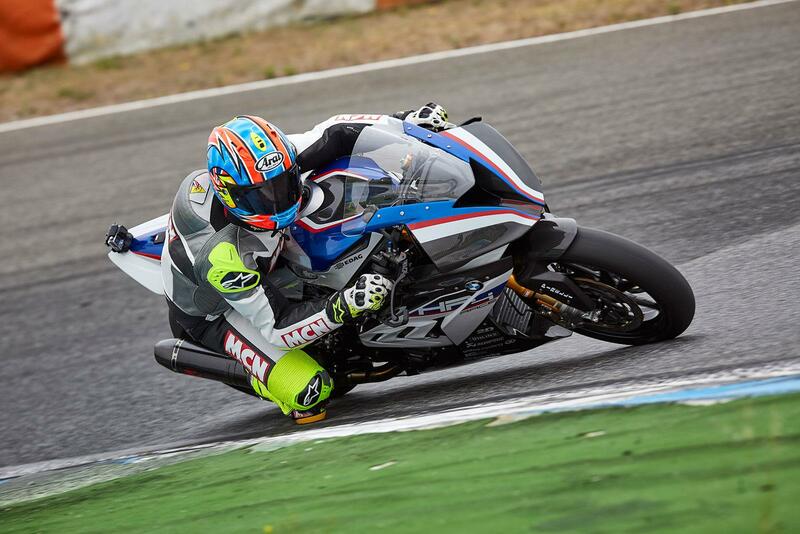 Power delivery is as smooth as a big-cammed, blueprinted 215bhp motor can ever be and picking up the power from a closed throttle at full lean is velvety perfection, but it accelerates through the upper gears with the same unbridled anger as the 199bhp S1000RR does in the first, second and third. 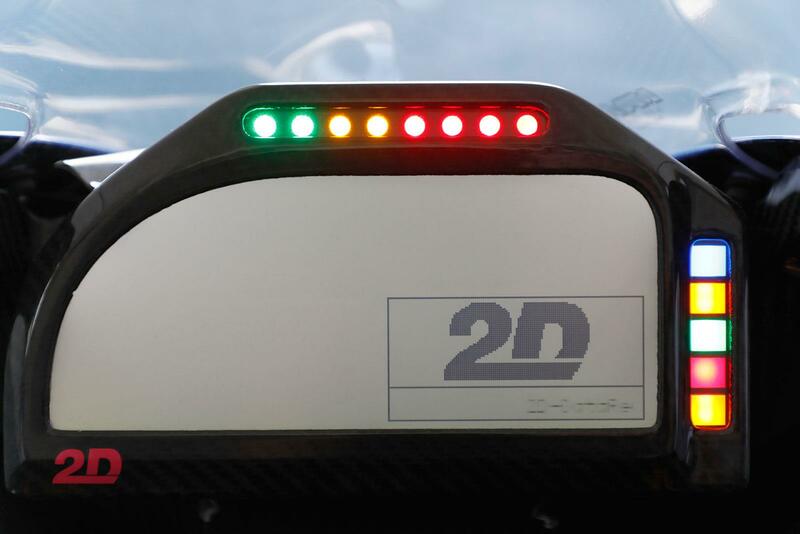 Traction, wheelie and fire-spitting engine braking control are now all adjustable corner-by-corner. They’re slightly more polished and refined than the already superb, but silent RR’s system, but the big change is now you can hear them working. 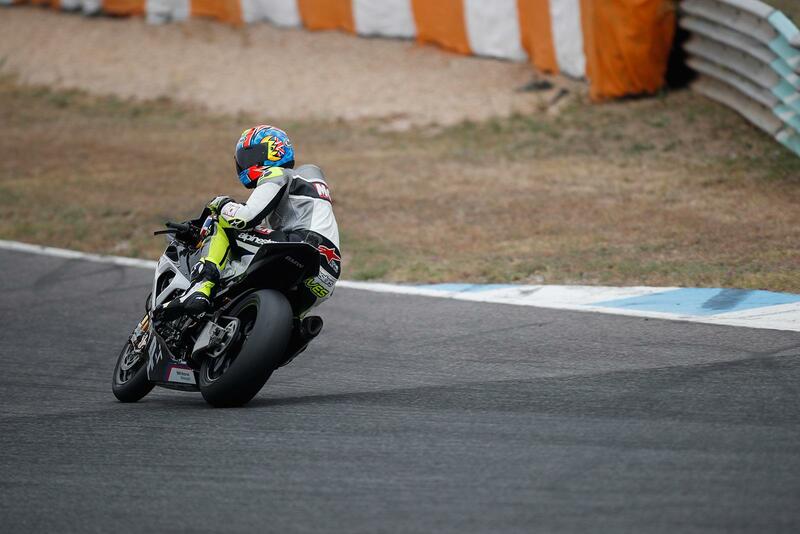 When the HP4 Race’s rear tyre slips or front rises the ignition cuts rather than retards, as before. It pops and gurgles, letting you know the electronics are doing their thing. This friendly silicone cry loads you with confidence, so you lean more on their control and the chances of you flinging your £68,000 carbon masterpiece into the scenery diminish. Anti-wheelie is a big step forward from the crudely-controlled RR. 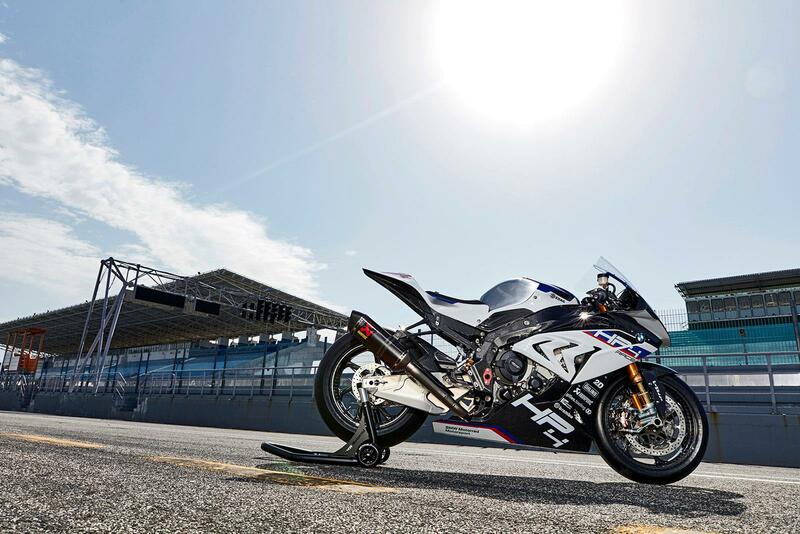 All the new-generation superbikes (except the Blade) have superb wheelie control systems, but the HP4 Race leapfrogs them all and places it firmly into WSB premier league. 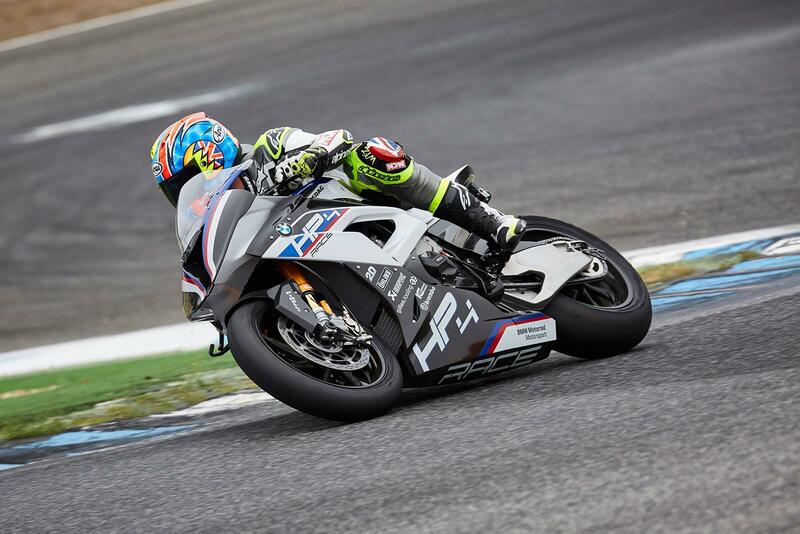 With the electronics taking control the HP4 Race takes off horizontally with such energy all you have to do is figure out how to hang on. 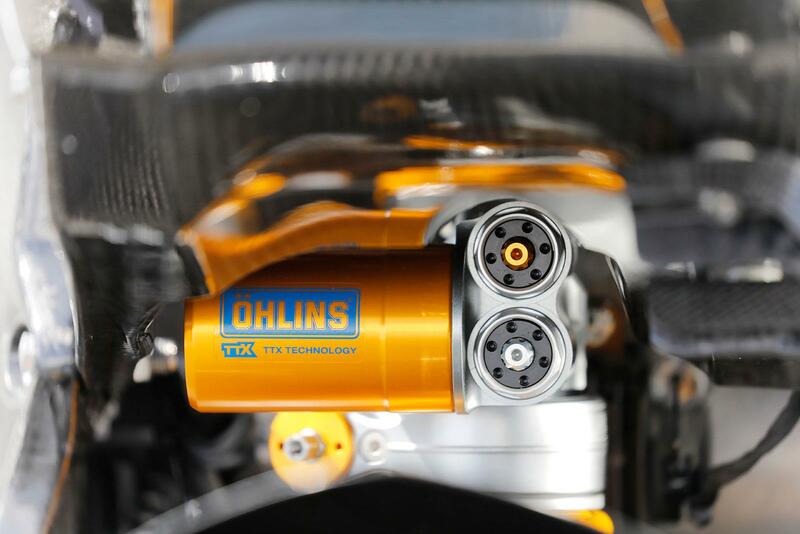 Ohlins FGR300 forks, TTX36 GP shock and Nickel-plated WSB/BSB Brembo GP4 PR calipers with titanium-coated pistons, race pads and 6mm thick racing discs are straight out of WSB/ BSB. 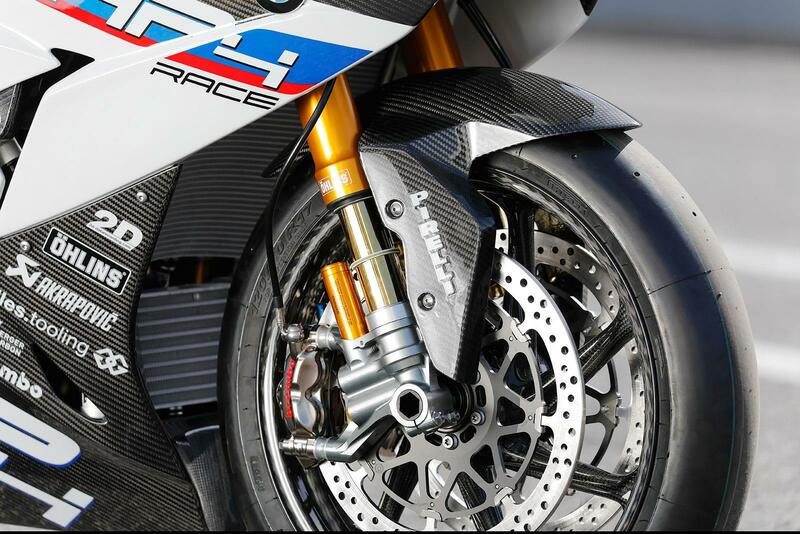 Brembo have made more calipers for the HP4 Race than they’ve done for the past five years supplying race teams. Ride quality, feel and control through the suspension is sublime and the force of hard braking is like being crushed by an industrial press. 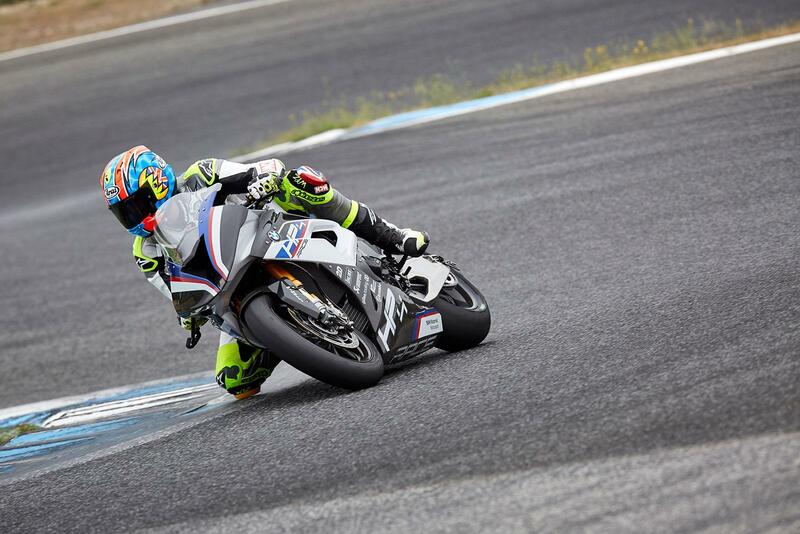 Acceleration and braking is violent and unforgiving, but in the corners the BMW is light and delicate on its feet. 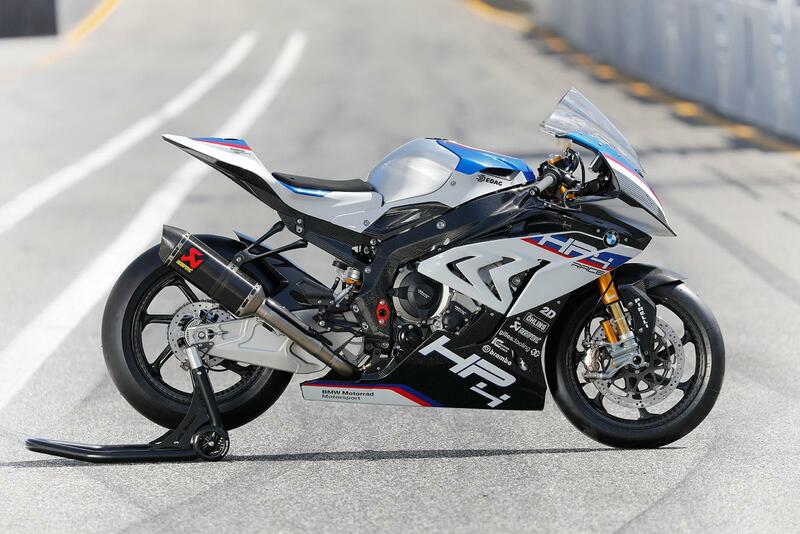 You’d imagine a superbike with a 7.8kg carbon fibre frame to be overly stiff and unforgiving, but the HP4 Race’s chassis is more compliant than the cast aluminium-framed road bike. It has all the stability of the RR, but there’s feel pouring out of it at full lean. 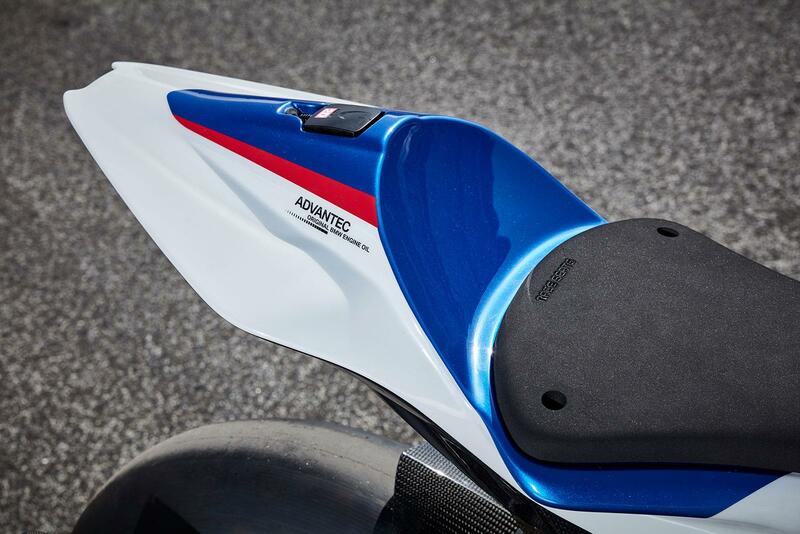 The WSB-inspired ali swingarm might not be carbon fibre, but it’s been created using the lessons learned from racing in superbikes since 2009. 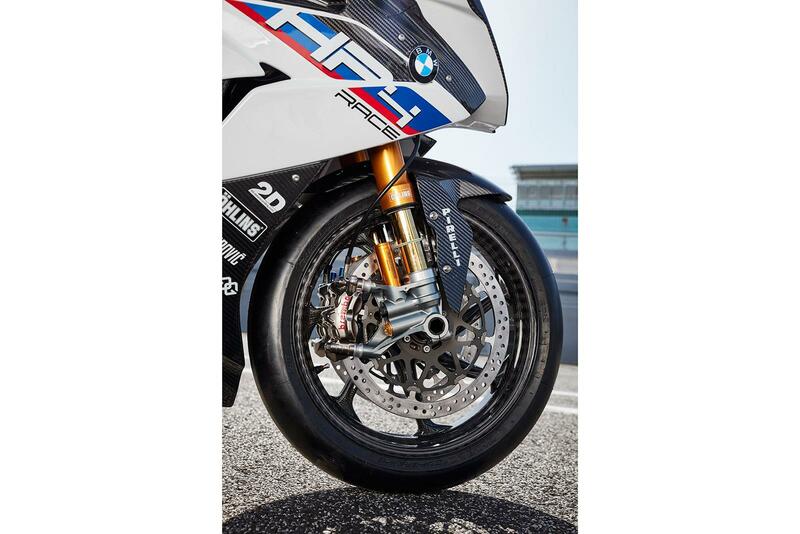 Add in the highest level racing Ohlins suspension you’ll find on any production bike and the unwavering grip of the SC2 compound Pirelli Diablo Superbike slicks fitted and you’ve got a machine that has cornering limits way in excess of all but the very talented few. 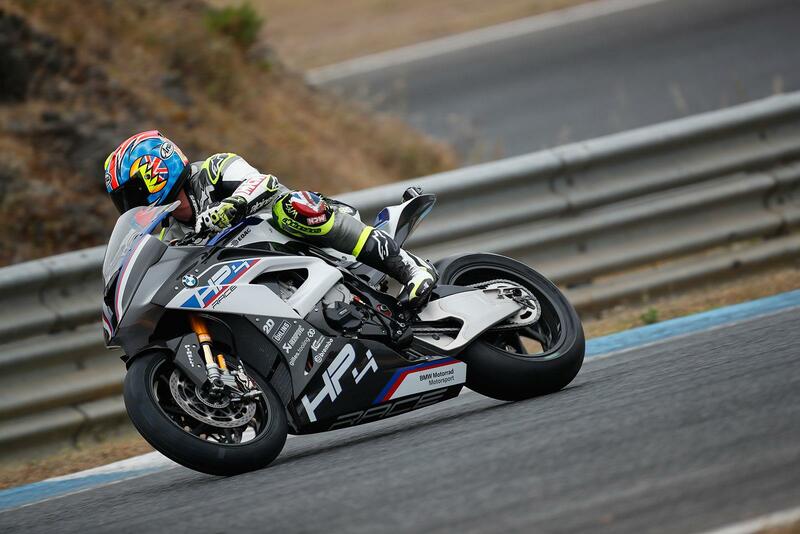 Agility in chicanes is like nothing a conventionally heavy superbike could ever muster and like the very best lightweight race bikes the HP4 Race can enter corners with devastating speed, which is the secret to its pace around a lap. 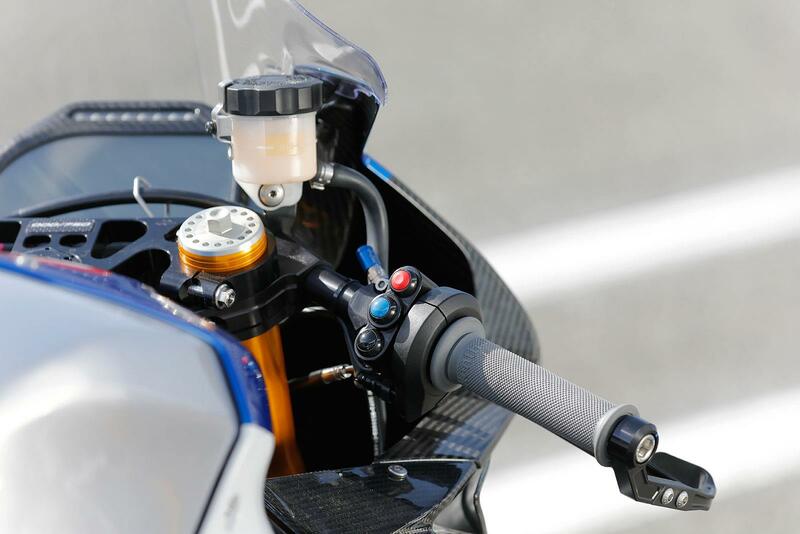 With such a beautifully set-up chassis it’s easy to place the HP4 Race exactly where you want, but the riding position helps even more. Big, wide clip-ons and spacious legroom (thanks to the height adjustable self-supporting carbon seat unit and rearsets) help even the tallest riders the space to get comfortable in the corners. 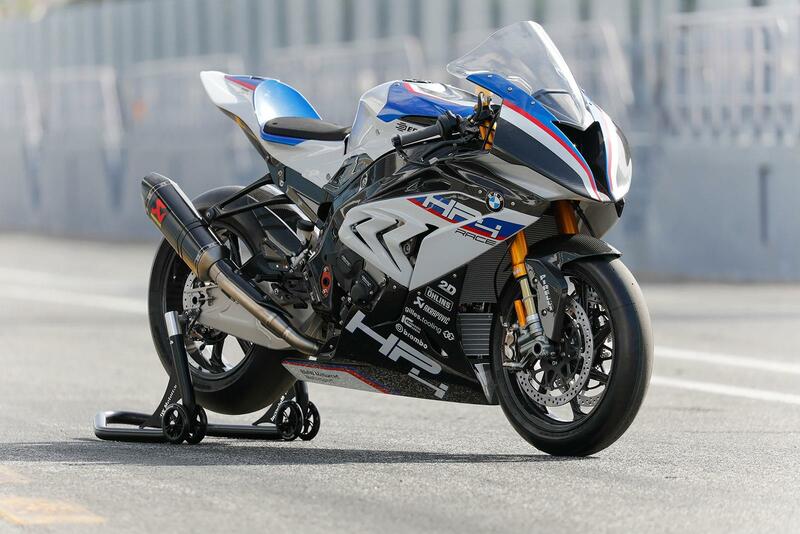 To get a superbike to weigh this little with a metal frame has always needed a healthy race budget, but BMW has managed it with the clever use of mass-produced carbon fibre, which means in the future we could see this technology on more affordable machines. Low weight is good for everyone. Light bikes are fun. They accelerate more vividly, stop and turn easier and give you more feel and involvement. With less weight to push along engines don’t have to do as much work, so they’re more fuel efficient, too. …and finally: how does it compare to a Superleggera? 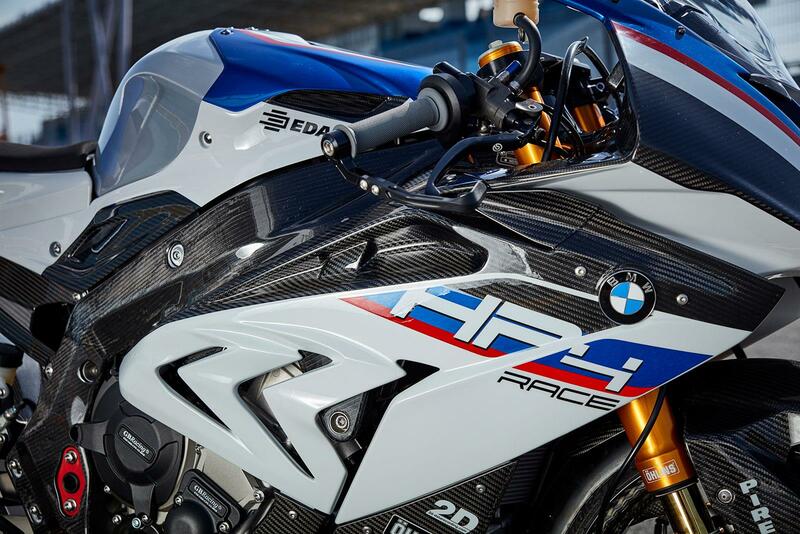 You wait for a carbon-frame superbike to arrive then two come along at once. 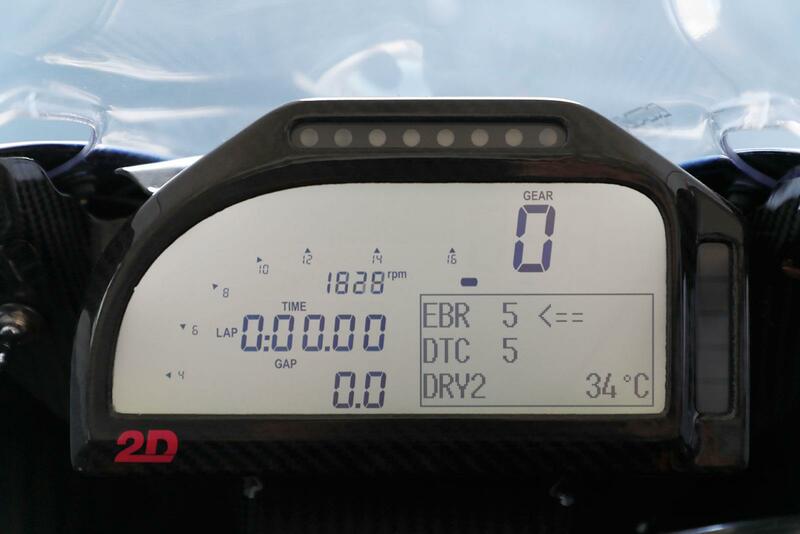 Launched a month after we rode the £72,000, 215bhp, 156kg (dry), carbon-framed Ducati 1299 Superleggera, BMW says it’s a pure coincidence, but admitted manufactures are all figuring out ways to make their bikes lighter to meet future regulations. 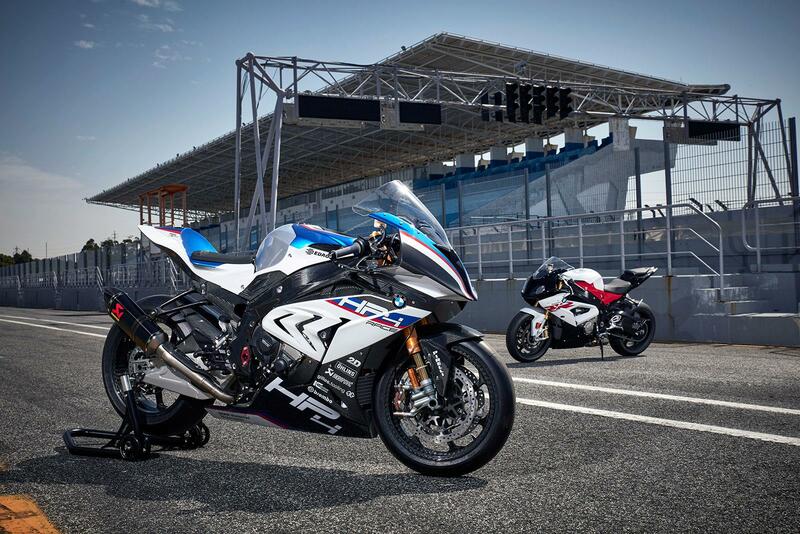 Just like the ‘normal’ S1000RR and 1299 Panigale road versions the HP4 Race and 1299 Superleggera share the same manufacturer’s DNA. 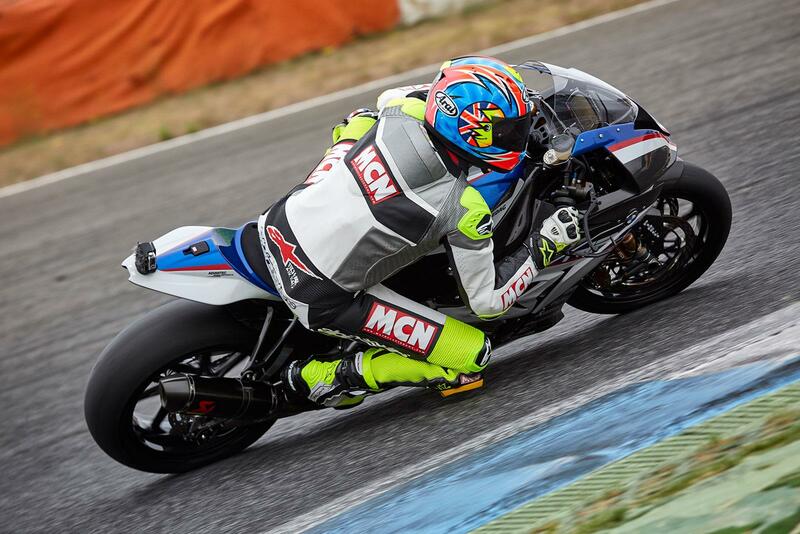 The BMW is calm, calculating, brutally fast and efficient, while the Ducati is more colourful, dishing out big lumps of V-twin power, like a sledgehammer to the stomach. 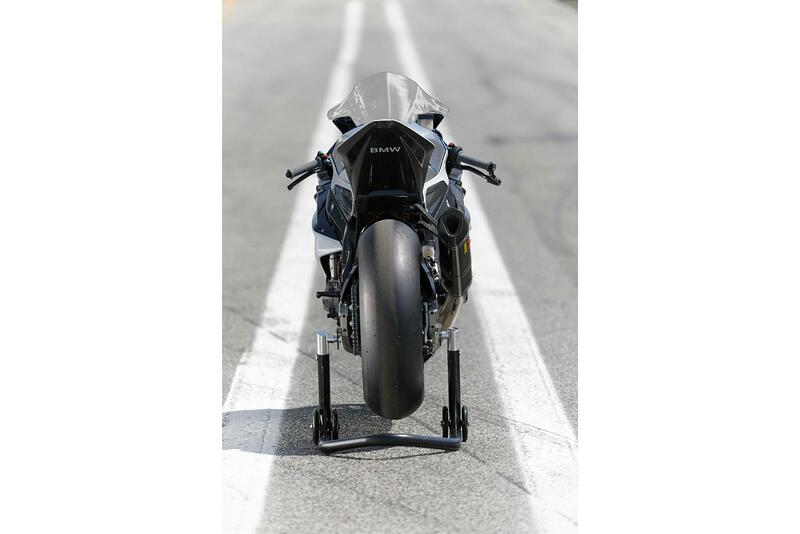 It’s even harder to hang on to the 1299 Superleggera under acceleration and trying to cling on to its slender frame under braking takes all your strength. 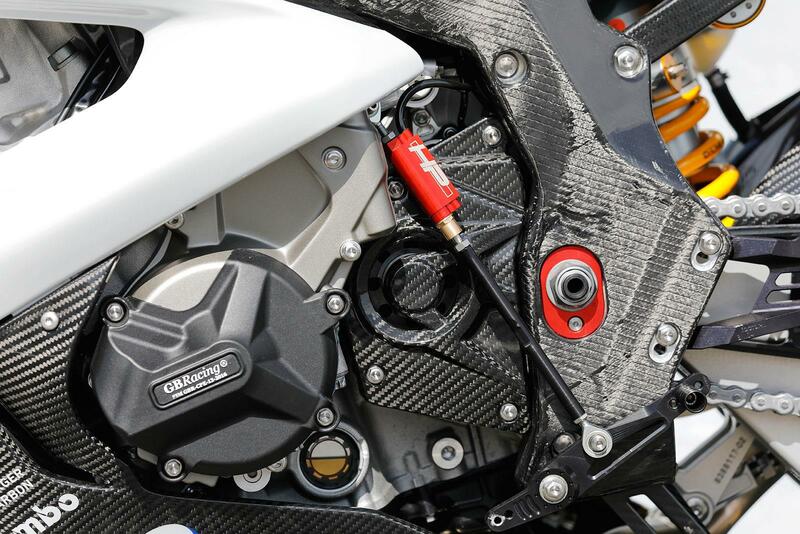 While the Ducati dances in your hands and sometimes weaves alarmingly through its middle gears, the BMW is stable and cossetting. 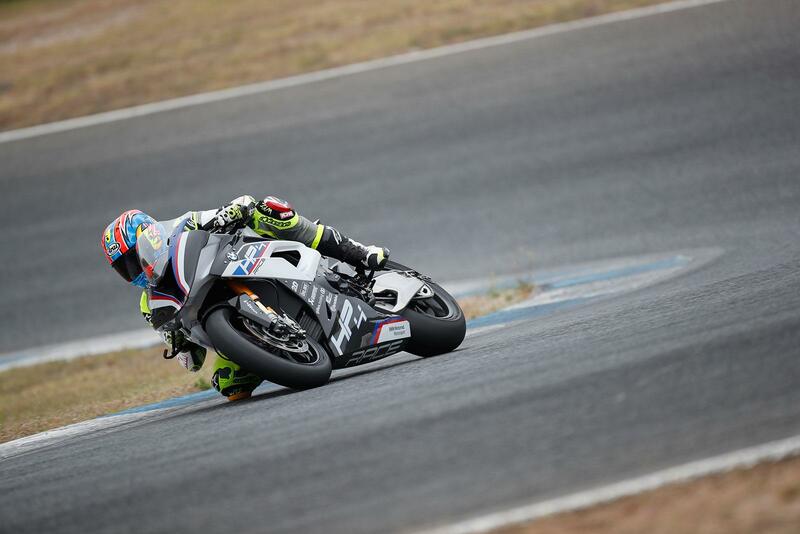 You need to work out how the 1299 Superleggera needs to be ridden to go fast, but you figure the Beemer out instantly. 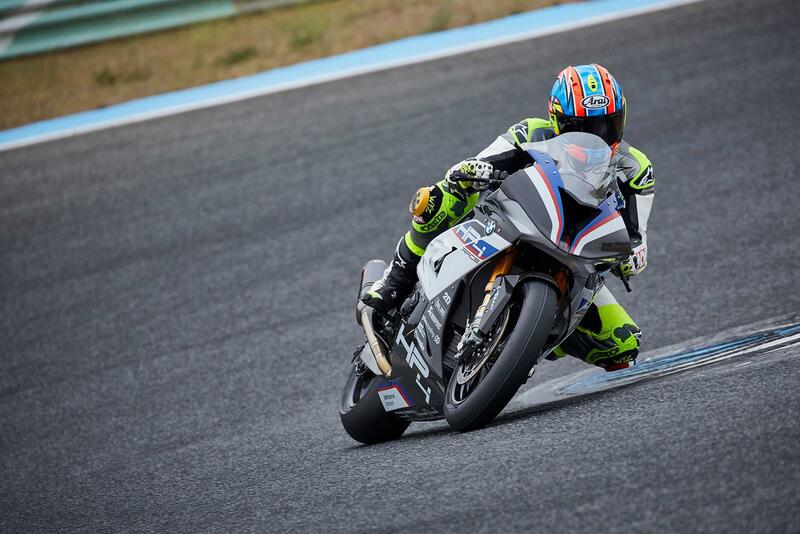 While Ducati wowed us all with its power and mouth-watering spec when it was announced, BMW crept in under the radar with an even lighter machine, boasting even higher spec, genuine race grade Ohlins and Brembos. But of course the Ducati can be ridden on the road and the BMW can’t.